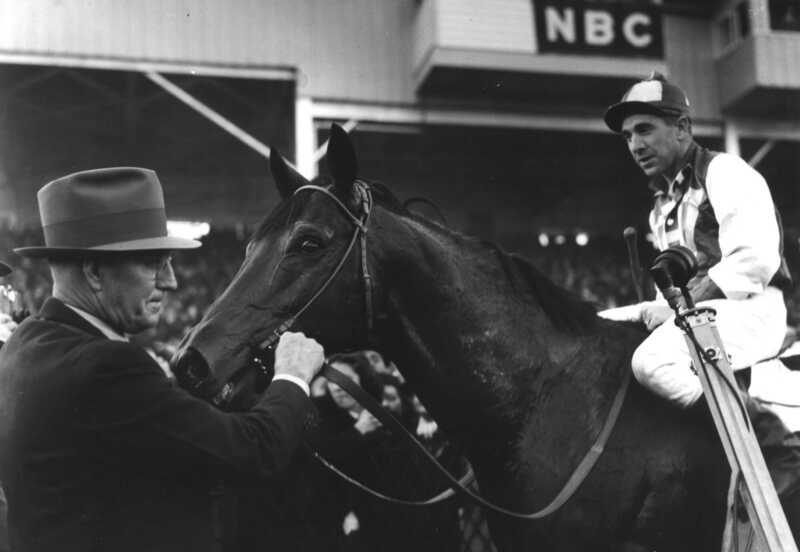 “Horses are in my blood,” said George Woolf, one of the greatest jockeys ever. “I’ll be with them until I die.” The jockey was right on both counts. His father, a stagecoach driver and rancher, “never had much money but always owned a fast horse,” Woolf had said. His mother, a circus acrobat, often performed on the back of a horse. The genes took, and in his mid-teens the boy started riding at racetracks. He earned his spurs riding in Montana and Woolf soon became a phenomenon in the minor leagues of racing. Woolf’s talents became legendary around racetracks. He seemed to have an internal clock in his head that could gauge how fast his horse ran during each furlong (each eighth of a mile around the track), an ability that allowed him to carefully pace his horse. He ran his horses so precisely that he became famous for winning races in the deciding final strides. His timing was so perfect that he didn’t lose a photo finish in a stakes race for 10 years. Woolf had other mental weapons. He memorized the details of how his competitors and their horses raced to provide him with the slight edge he needed. He even visualized his races. Before each contest, the jockey would close his eyes to imagine the race and how he would win, a technique that athletes are encouraged to use today. His closest rival in the sport, Eddie Arcaro, said that Woolf, always the perfectionist, didn’t ride in his races, he crafted them. Another advantage seemed to run not through the great jockey’s mind, but through his veins. He never seemed to panic in the chaos of races. “Iceman” was his nickname. Woolf’s style was cowboy cool: he wore a ten-gallon hat, large rings on his fingers, tailored gabardine shirts, and cowboy boots decorated with animals made of silver. He drove a hot-rod Studebaker roadster. He drew the attention of a lot of women but picked one: a beautiful 16-year-old waitress named Genevieve. In 1931, at the age 21, he married her. 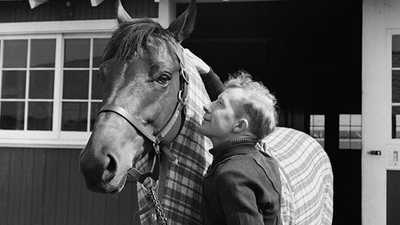 By 1938, the year Woolf would ride Seabiscuit against War Admiral, Woolf had been wrestling with a disease that he had kept secret for years: Type I diabetes. Those who watched him race and socialized with him only noticed a side effect of the disease that they assumed was another of his idiosyncracies: he fell asleep often and suddenly. Insulin had only been discovered ten years before, and Woolf gave himself daily shots, but the dosages could not be gauged precisely in those early years. Doctors of the day recommended he eat regular, high-protein, low-carbohydrate meals — meats were pushed — but this was not a jockey’s diet, especially for a jockey who leaned toward the heavy end of the allowed weight range. Woolf decided to ride only the top horses. They were allowed to carry heavier jockeys, which meant Woolf could eat more. This decision restricted him to between 150 and 200 mounts a year, compared to other riders, who could run as many as 1,000 times annually. Still, Woolf’s incredible winning percentage consistently put him in the top of the national jockey rankings for purses won. After Pollard was injured, Woolf rode Seabiscuit in the 1938 Santa Anita Handicap. In it, Woolf and Seabiscuit were credited with one of the greatest performances ever — although the horse and rider came in second by a nose. Later that year, Woolf would ride Seabiscuit in his epic battle against War Admiral. The Iceman turned to his friend Pollard for advice. Pollard’s unorthodox suggestion was to take the lead early, then let War Admiral catch up in the backstretch. When challenged, argued Pollard, Seabiscuit would prove the gutsier horse and press to victory. Woolf followed the strategy to victory; he and Seabiscuit beat the great War Admiral by a convincing four lengths. By the time Pollard was in his early teens, he had decided that he wanted to be a jockey. 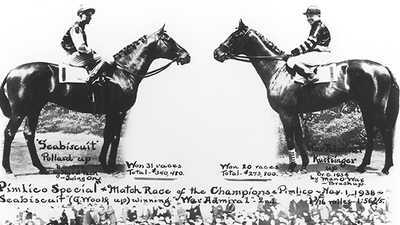 The spirited rivalry between Seabiscuit and War Admiral was also a battle between the era’s dominant Eastern racing establishment and the upstart Western one. 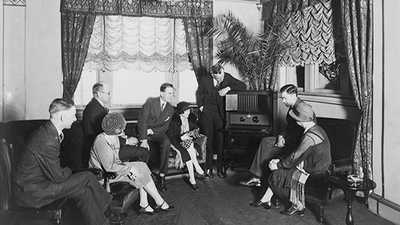 Many of Seabiscuit's fans listened to his races on the radio, the revolutionary technology that came of age just as Seabiscuit did.